Early on Saturday I found myself at PayPal’s London offices, gathered with over 150 internal comms folks from around the UK (and beyond). It was a fitting venue, as it was home to the first Tweetcamp, where I also had the privilege of facilitating a very dynamic series of conversations. The IC Crowd pulled together an amazing event – if you follow @jenniwheller, @AllthingsIC or @danaleeson on Twitter, you’ll have expected no less! 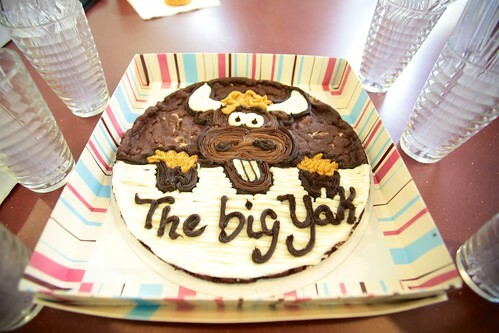 The Big Yak is an “unconference” – is that a new or familiar style of event for you? 1. There are no attendees there are only contributors -a traditional conference consists of ‘speakers’ and an ‘audience’. That is a great format if you have a few experts, and lots of people who need to learn. At the Big Yak we had a room full of experts. Everybody had something to learn from each other. That is where unconferences excel – everybody has something to contribute. When it comes to comms, how would you describe yourself? 2. It’s your agenda, because you make the agenda. Own it. Shape it. Share it. The people there on the day, quite literally, build the agenda. Everyone had the opportunity to suggest or lead a session, within the constraints of the available time and space. Similar topics were combined, and popular ones extended. 3. The only prerequisite for proposing a session is that you host it and enable people to participate. You don’t have to be “the expert” to lead a session. You simply need to create the space – guiding and balancing the conversation, so that people get to ask questions and share their insights. 4. If you find yourself in a situation where you are neither learning nor contributing, use your feet to go somewhere productive. Better known at the rule of two feet, which Harrison Owen states simply as: “If at any time you find yourself in any situation where you are neither learning nor contributing, use your two feet and move to some place more to you liking. Such a place might be another group, or even outside into the sunshine. No matter what, don’t sit there feeling miserable.” Or, as I like to put it: Life is too short to be in the wrong meeting. 5. A session goes on as long as it needs to, or until the next session starts. This is something of a classic open spaces rule. In our on-line social world, I like to add: Just because it ends, the conversation isn’t over. There is a finite amount of time for a session, but it doesn’t have to fill it, just for the sake of using the time. Similarly, the biggest output of the session is often the discovery of new people with similar interests, for whom this is (hopefully) just the first of many future conversations. 6. Create artefacts. They help you to understand and remember, and they provide access to others. Andrew Hesselden asked me via Twitter what I meant by artefacts. Artefacts are things civilisations leave behind that show that they existed. In this context, that’s tweets, photos, blog posts, Vines, anything that captures the conversations, and makes them accessible to others. On the day, we had hundreds of people following from all over the world via Twitter. Social technology enables us to bring people into the room who couldn’t (physically) be in the room. That was more than enough to get us going. The day was organised using my favourite solar powered constraint management system: a white board, some postit notes, a collection of pens, and Dana Leeson’s sharp eye for detail. We ran 4 tracks, across 6 sessions through the day, with a fair few side discussions. We re-adjusted the overall timings three times during the day, including a rework to allow for train delays, and an adjustment at lunch-time. Pretty good going! 24 packed out sessions, and a huge amount of energy for the length of the day, spilling over to some time over refreshments at the end of the day. Here is my Storify of the day, featuring many of the tweets that caught my attention. And, as I said at the end of the day, the biggest thank you goes to the people who provided the content and created the event on the day – those who came along or joined in via Twitter – thank you for the insights and expertise that you shared!